New and Used Wire Decking at Unbeatable Prices! Ace has wide variety of wire decking for pallet rack and other industrial racking systems. Wire mesh decking is a great way to conve rt standard pallet rack into space for smaller items. 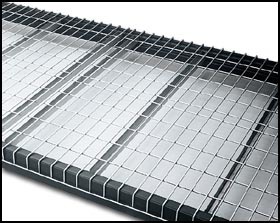 You can install wire mesh warehouse decking by simply dropping it into place. No special tools are required. There are countless ways to use wire decking, for example, paperwork storage, visible inventory management, and food storage. Wire decking improves visibility and cooling within a warehouse. In addition, wire mesh decking enhances safety (it reduces fire hazards) and cleanliness (dirt and rust do not collect on it). For more information on Ace’s wire decking or steel decking call us today.